This is an interesting set of trading cards made of metal. Put out in 1998 by Metallic Images (slogan: “Not just another card. It’s a memory! 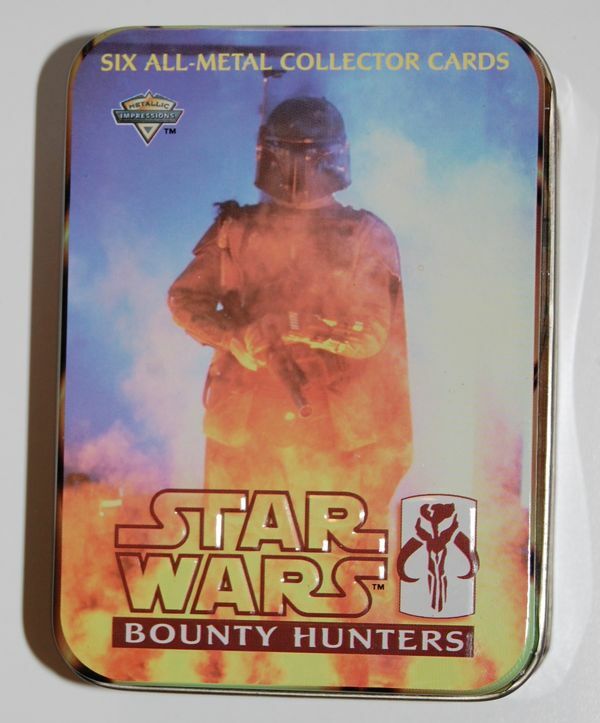 ), this particular set features a “bounty hunter” theme. Now, if I said a set of six cards was “bounty hunter” themed, you’d probably think that it included Dengar, IG-88, Boba Fett, Bossk, 4-LOM, and Zuckuss, but in this case you’d be wrong. In fact, it does include cards for Dengar, Boba Fett, IG-88 and Bossk, but the other two cards are for Greedo and Jabba/Han Solo. An odd decision if you ask me, although I can’t really complain about the addition of Jabba. I can complain that it’s the crappy CGI version, though. The cards are made of metal, as I said, which does give them some nice weight. They have edges that are curved-over and the cards are relatively thick to begin with, so they feel quite sturdy. Each card has a picture on the front and another picture with some info about the character on the back. Overall, it’s an interesting concept that apparently didn’t catch on.